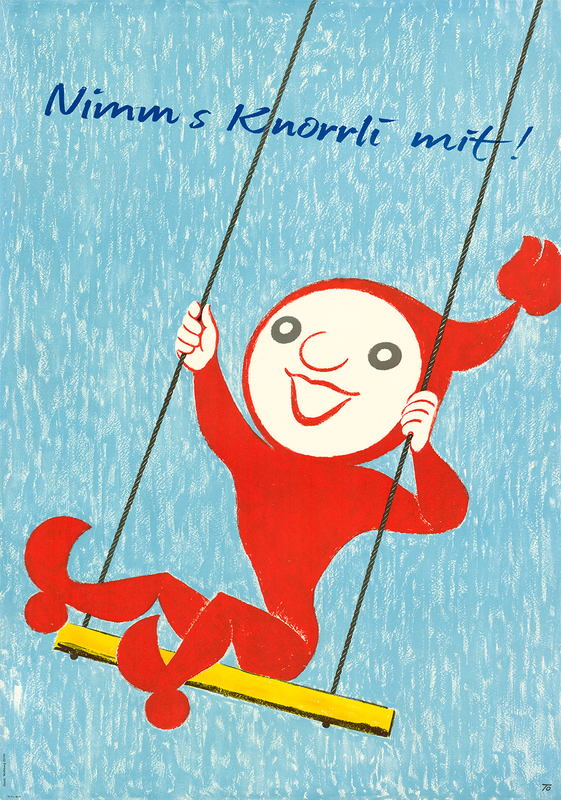 It’s Knorrli’s 70th birthday! 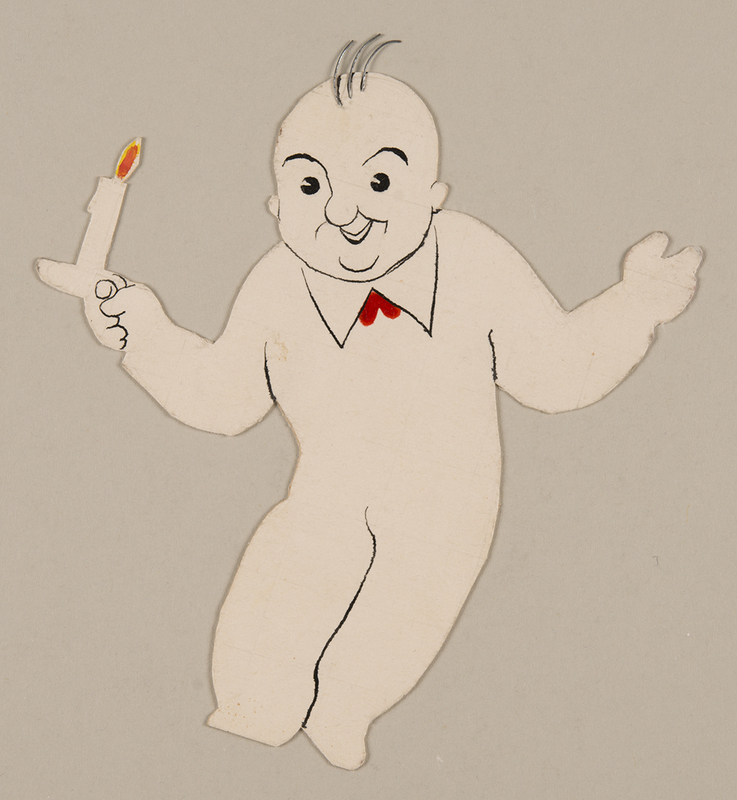 The chipper wee chap with his round face and red pointed cap is one of the best-known figures in Swiss advertising. No one would think Knorrli has been around for seven decades. 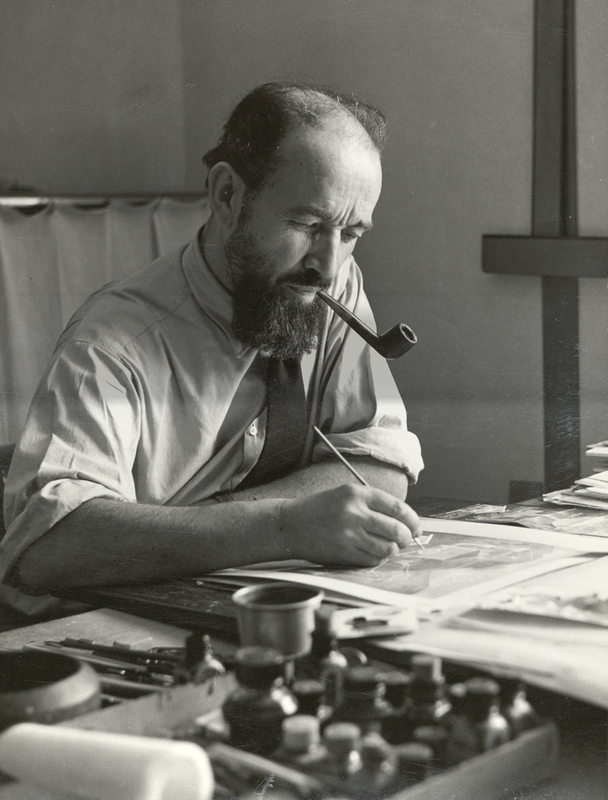 His designer, a commercial artist and painter from the Ticino called Hans Tomamichel (1899-1984), was born as the nineteenth century drew to a close. Spiritedly and eye-catchingly as ever, Knorrli scampers across the packaging of Knorr products with a ladle, a soup plate, a tureen, a staff or a skipping rope in his hands. Starting in 1948 when he was still called Knorritsch-Maa – Knorritsch rhyming with porridge – he began to advertise oat flakes, soup sausages, and packet soups; after 1953 he set to work on Aromat seasoning, and in 1960 he began to advertise Stocki mashed potatoes. 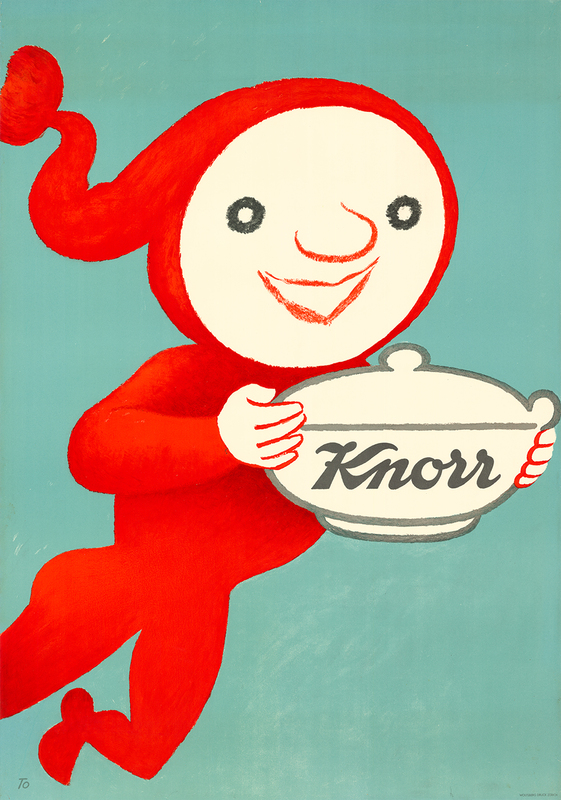 Knorrli took shape in the hands of Hans Tomamichel during the second half of 1947. 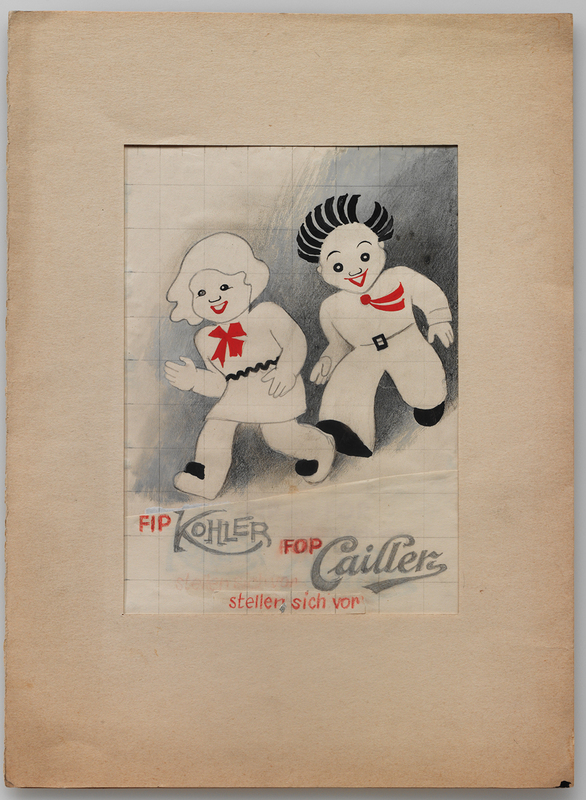 The commercial artist from the Ticino village of Bosco-Gurin was not unknown: he had already designed the figures of Fip and Fop for adverts by the chocolate makers Nestlé, Peter, Cailler and Kohler (N.P.C.K.). 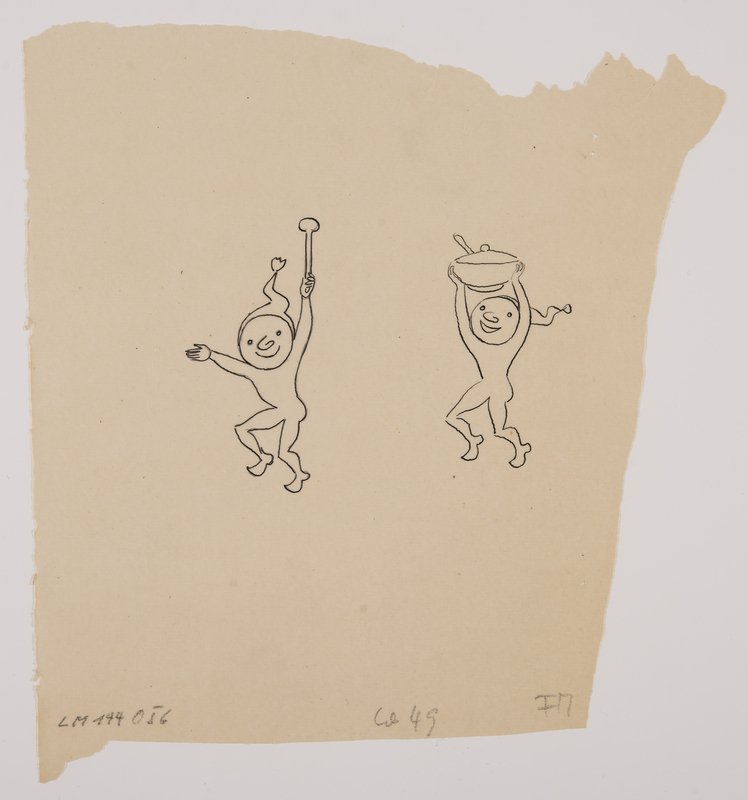 According to the artist himself, he modelled Knorrli on a friendly mountain gnome from his village in the Maggia valley: “I gave him a round head – just like a soup plate.” The designer’s clients loved his first drafts. 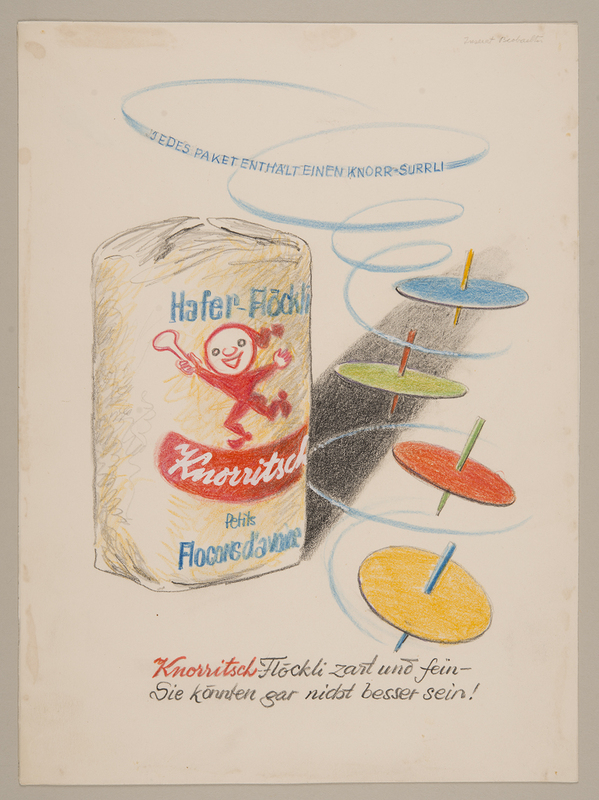 In a letter dated 22 December 1947, the new director Johann Conrad Weilenmann and the new head of advertising Hans Ruckstuhl, who had also joined the company that year, wrote to the artist in Zurich from Knorr headquarters in Thayngen (Schaffhausen): “We are delighted with Knorritsch-Mannli, and think he is very lively and stimulating. 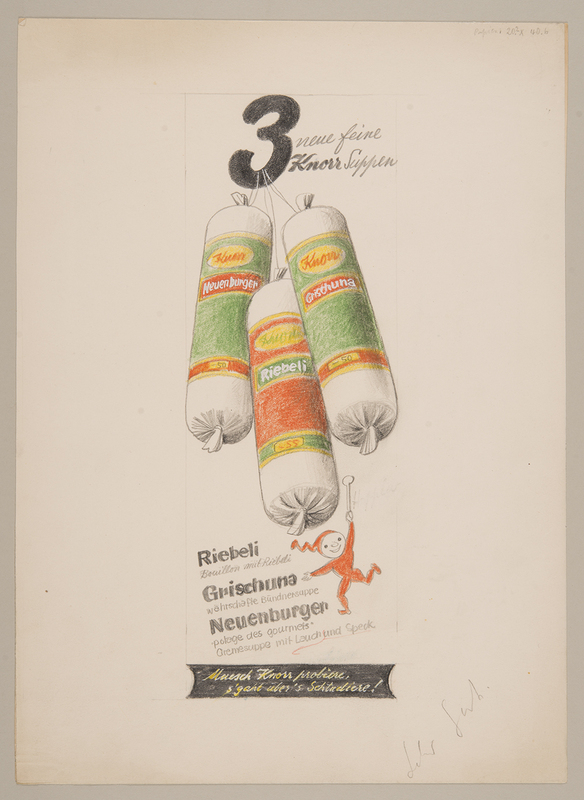 Your drawings and the adverts are attractively conceived.” The two new managers and the new advertising figure mark the beginning of a success story for Knorri, as the factory was popularly called. 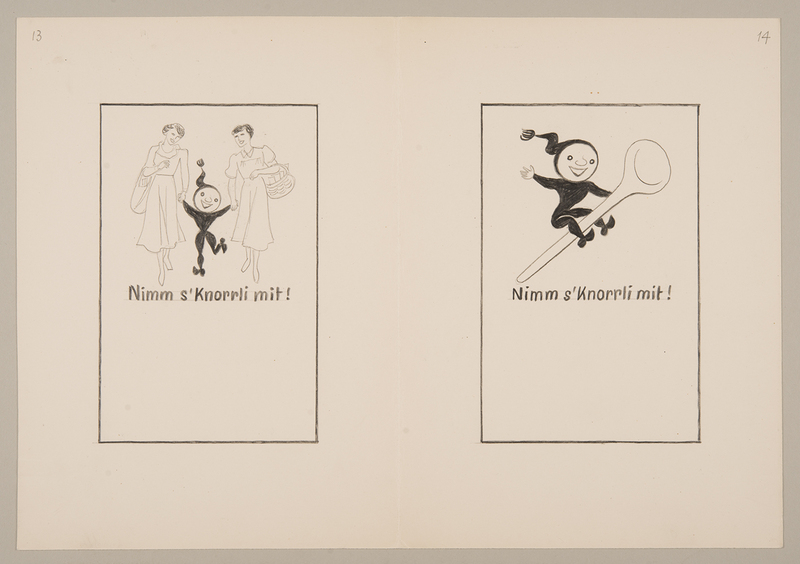 With a bell in his hand, Knorrli first appeared in a newsletter early in 1948: “It comes from Knorritschmannli’s mouth: knorritsch belongs in every house!’’ (“s’ Knorritsch-mannli ruft es aus: Knorritsch g’hört in jedes Haus!”; Knorr newsletter, no. 3). 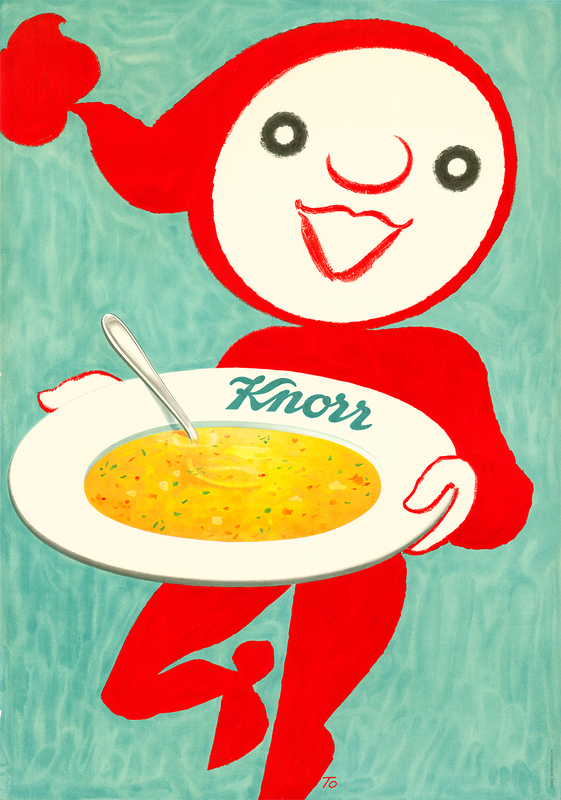 His first appearance as Knorrli in an advertisement was on 15 September 1948 in the consumer magazine Der Beobachter: “De Knorrli bin i – Knorr Suppe bring i.” (“Knorrli is my name, Knorr soup is what I bring”). On packet soups, a ladle, tureen or soup plate and spoon became the main attributes of this fictional Swiss, who to this day still advertises foodstuffs made exclusively in Switzerland. 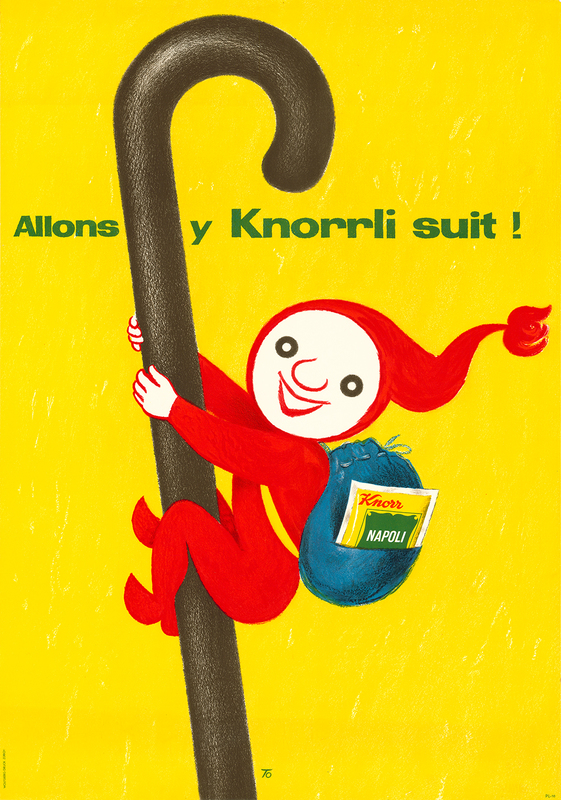 “Take Knorrli with you!” (“Nimm s’Knorrli mit – Allons y Knorrli suit”) was Knorrli’s slogan when his attributes were a staff and a rucksack in an era when the Swiss were a nation of Sunday ramblers and holiday campers. 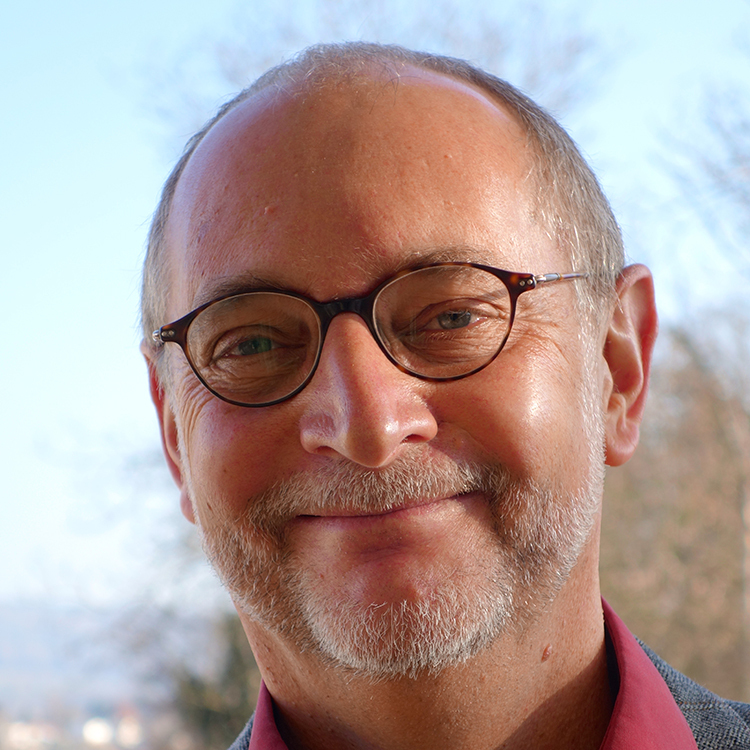 In our imaginary pantheon of famous fictional Swiss, Knorrli the kitchen assistant deserves pride of place between Globi, fifteen years his senior, and the famous chef Betty Bossi, nine years his junior. 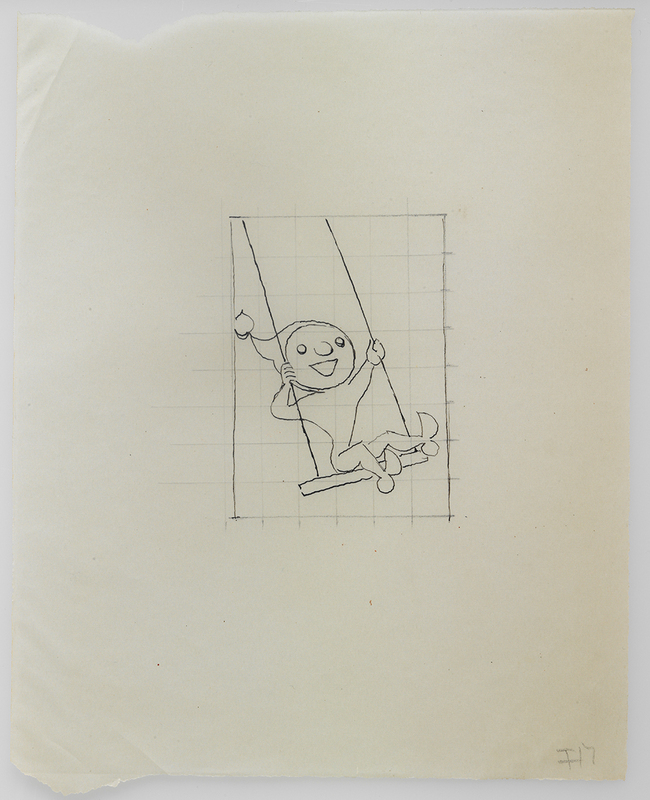 Knorrli was not the first advertising figure designed by Hans Tomamichel to become famous. 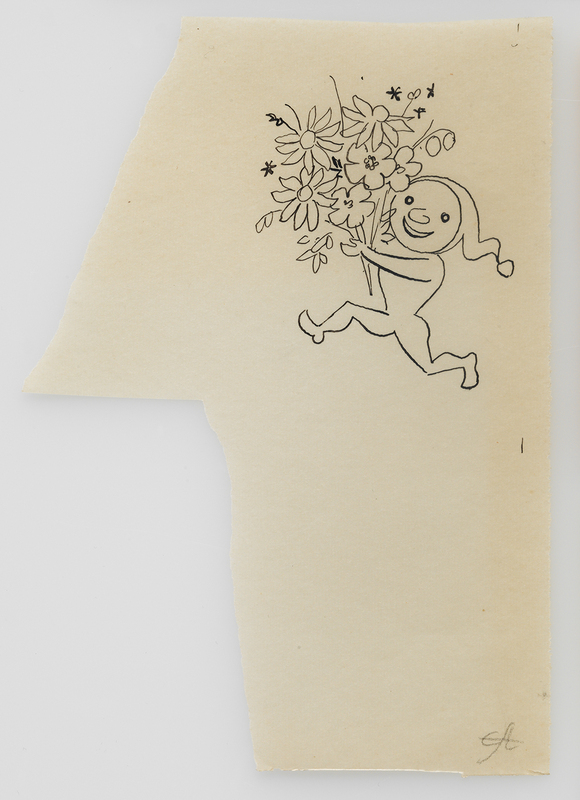 As early as 1929, on behalf of Ulmer & Knecht AG, a wine merchant in Zurich, he designed the Ulmer Knechtli, one of the very first modern Swiss advertising figures. From 1932, the artist was commissioned to produce advertising for the combined chocolate makers N.P.C.K (Nestlé, Peter, Cailler and Kohler). 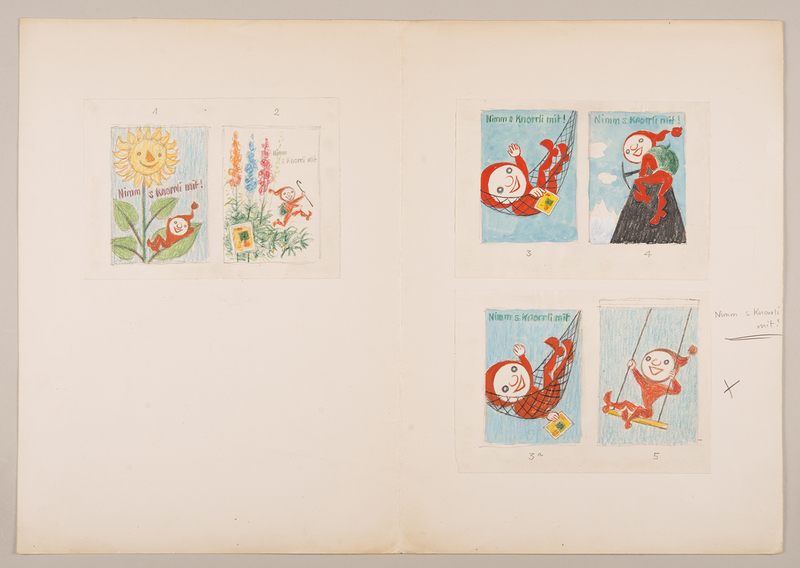 The result was the twins Fip Kohler and Fop Cailler, who were known to almost every Swiss child well into the 1950s. 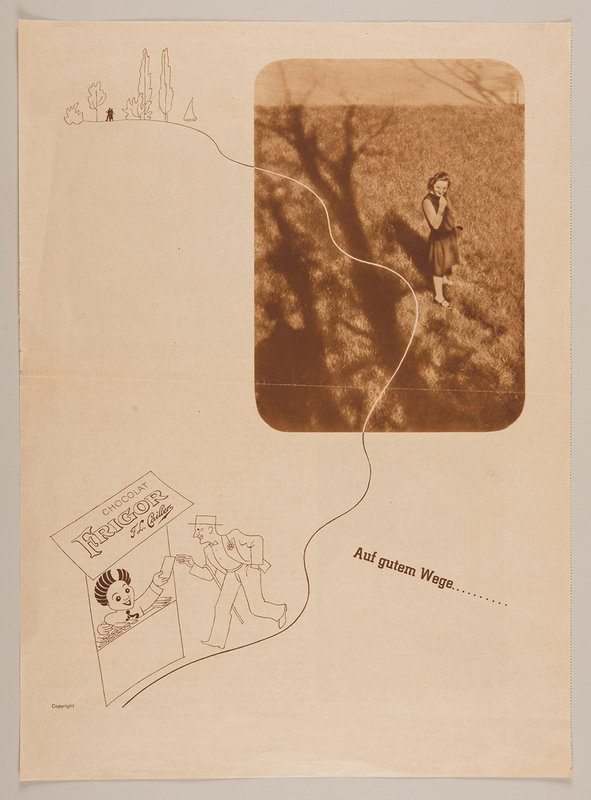 In his advertising matter, especially full-page newspaper advertisements, Hans Tomamichel was one of the first commercial artists in Switzerland to combine his drawings with photographs. In 1936, Nestlé set up the Fip-Fop-Club, a film club for kids. Payment of one franc secured admission to two screenings a year, a Fip-Fop badge, and a subscription to the club’s magazine. Films were screened in existing cinemas. There were films about the manufacture of chocolate, of course, but cartoons, documentary films, and feature films with Charlie Chaplin and Laurel and Hardy were also shown in an era when not every living room had a wireless set – let alone a television – and pocket money, if it existed at all, was limited, and you had to be 16, if not 18, to get into the cinema. On top of that, the Fip-Fop-Club was the place to swap Nestlé’s much-loved collectors’ cards. The good girl Fip and the rascal Fop dropped out of sight with the rise of television, however, and the generation that associates them with its first experience of going to the cinema is now getting on in years.